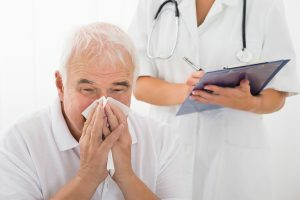 Elder Care in Marlboro Township NJ: Cold or Allergies? How Do You Know If It’s a Cold or If It’s Allergies? Allergies and colds are very similar when it comes to common symptoms. How do you know if a senior citizen has a cold or is simply dealing with allergies? Here are some of the differences. What They Have in Common. A runny nose, sore and scratchy throat, and congestion are symptoms you’ll find with both a cold and with allergies. Both can appear at any time of the year, though seasonal allergies are more common during seasons when pollen counts are high. What Allergies Have That Colds Often Don’t. With allergies, itchy, red, and watery eyes are a common complaint. Allergy sufferers also find themselves sneezing constantly. It’s not as common for someone with a cold to sneeze uncontrollably. What Colds Have That Allergies Often Don’t. It’s not common for someone with seasonal allergies to develop a fever. For someone dealing with a severe cold, fevers are common. It’s also not common for someone with allergies to feel achy, but it’s common for someone with a cold. Colds get better after approximately a week. Allergies don’t usually improve until the triggering pollen or substance goes away. Dealing With a Cold or Allergies. If you know what’s causing an elderly adult’s symptoms, you’ll be able to determine the best ways to help ease them. With a cold, drinking lots of fluids helps. Herbal tea with lemon and ginger will help with congestion and the sore throat that often happens with postnasal drip. Adding moisture to the air will help with a cold’s congestion. You can do this by boiling a pot of water and placing it in the room where the sick person is sitting. Draping a towel over a bowl of steaming water and then breathing in the moisture may also be helpful. Allergies benefit from allergy medications like Benadryl. A cold relief medication is better for someone with a cold. Allergy medications work on the inflammation caused by irritation. Cold medications offer relief to multiple symptoms, such as aches, congestion, and cough suppression. Watch to see if the cold goes away. If it worsens after 10 days, call a doctor. Sinus infections can occur at the end of a cold. Pneumonia is another potential complication. When an aging parent has a cold, you want to make sure they get plenty of rest. One way to do this is by hiring elder care services for the duration of the cold. Who knows, they may enjoy having help enough to ask you to keep the caregiver on when your parent feels better. Call an elder care service to learn more about your options. If you or an aging loved one are considering elder care in Marlboro Township, NJ, please contact the caring staff at Lares Home Care 888-492-3538 or 732-566-1112.